The paper considers the make-up water heating capability and conditions in the built-in tube bundles when cooling water is concurrently piped through the main turbine condenser bundles. 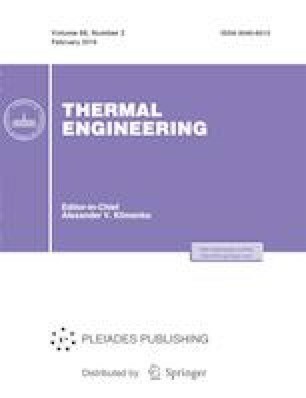 Based on the analysis of experimental and calculated data, a technique is proposed for estimating heat fluxes entering the condenser when the turbine plant operates in the heat production mode. It is shown that, for efficient operation of the built-in bundle as part of the condensing system, all heat fluxes coming in addition to the wheelspace should be directed into the regenerative heating zone under the built-in condenser bundles through special water distribution devices, and the inlet zone itself should be separated from the condenser chamber by enclosing shields. The calculation studies were carried out using a mathematical condenser model of a cogeneration steam turbine plant with built-in condenser bundles. The studies were performed on the model of a turbine plant T-50-12.8 for three seal levels of the low-pressure sliding grid and different make-up water flows and temperatures. The conducted researches made it possible to determine the heat distribution in the condenser between the condenser bundles in different turbine operating modes and to reveal the absence of pressure constraints in the condenser and make-up water temperature constraints at the outlet of the built-in bundle. Based on the turbine plant T-50-12.8 mathematical model, thermal efficiency calculations were performed using the built-in make-up water condenser bundles when the main bundles operate in the cooling mode. It is shown that the heat economy of the turbine plant operating in the considered regimes in the heat production mode with the make-up water flows close to the nominal make up 70% and more of the condenser heat load.